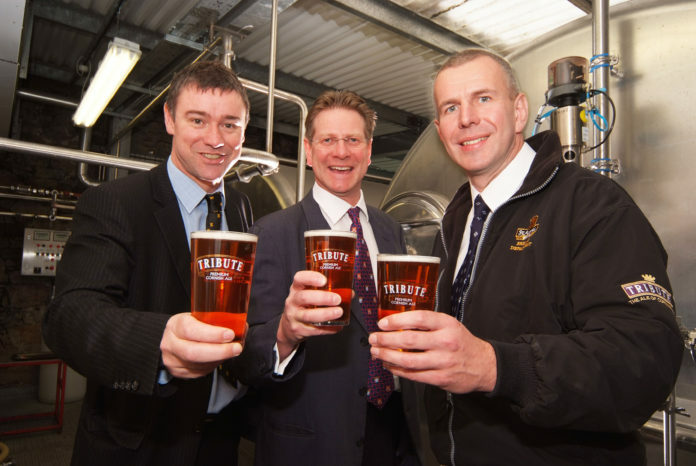 Left to Right: Jeremy Mitchell, Head of Marketing; James Staughton, Managing Director of St Austell Brewery and Roger Ryman, Head Brewer. St Austell Brewery is celebrating a triple success for its flagship Tribute Ale after it was named as one of the UK’s top ten ales, clinched a national sales deal with Waitrose and smashed its sales records for the seventh successive year. Tribute’s achievement in making it into the coveted top ten of the UK’s premium cask ales is based on sales volumes in Britain’s pubs and means it is the first Cornwall- or Devon-brewed beer ever to make it into the national chart compiled by the Nielsen Company, the world’s leading provider of marketing information and audience measurement. The national deal with Waitrose will see Tribute sold in selected larger stores across the country and means even more people can taste for themselves why Tribute has enjoyed such meteoric growth since its launch in 2001. It comes in addition to existing national listings for Tribute with Asda and Sainsbury as well as being sold across the South West in Tesco, Co-op, Spar and Thresher stores. It has all added up to a boom in Tribute sales which have soared 25 per cent on last year and led to the Brewery having just completed the second major expansion of its brewing facilities at St Austell in the last two years. Two massive new fermentation vessels have been craned into the Brewery in addition to a pair installed in 2006, which soon reached full capacity. The latest expansion now gives St Austell the capacity to brew up to two million pints each month. Neil Whelpton, Buyer – Beers and Cider for Waitrose said: “Tribute is becoming an increasingly successful brand nationally and we are delighted to have agreed with St Austell Brewery to add this fine Cornish ale to the selection of quality beers offered by Waitrose. Research by industry analysts Nielsen for trade publication The Morning Advertiser found that against a national fall of five per cent in beer sales (and eight per cent for lagers) premium cask ales were bucking the trend with a 0.4 per cent rise. Tribute’s inclusion within the top ten of premium cask ales comes following a study for The Publican earlier this year which listed Tribute for the first time among the UK’s top drinks brands, putting it alongside international brands such as Pernod and Jim Beam. The last 18 months have seen significant growth in Tribute’s profile regionally after it was named the South West’s favourite beer in British Beer Awards run by Cask Marque and the Daily Telegraph. Tribute is also the official beer of South West rugby through its sponsorship of the Tribute Leagues and this has helped drive the popular “Tribute – You’ve Earned It” marketing campaign which is playing a key role in driving sales. Nationally, as well as increasing off-sales through deals like Waitrose, Tribute is continuing to expand its popularity as a cask ale and at any one time there will be more than 1,000 pubs across the UK carrying Tribute behind the bar either as one of their regular beers or as a guest ale. L-R: Jeremy Mitchell, Head of Marketing; James Staughton, Managing Director of St Austell Brewery and Roger Ryman, Head Brewer.